The year 2017 was packed with love and support from all of our fans. We laughed, we cried, we sought shelter, we stayed warm even when winter was coming. But most importantly, we delivered warm and toasty pizzas all over the country for you guys to enjoy. Let’s take a look back at the best moments from 2017. We know you want to be updated every second. We know you want to know the journey your pizza takes before it reaches you. So, we decided to launch Howie Track™ in 2017 as a tool to help you track your pizza, every step of the way. Included in the Hungry Howie’s® App that simply makes ordering your pizza that much easier. Those of you who were brave and lucky enough to taste these new Flavored Crust® styles -- props to you! Those of you who didn’t try them -- don’t worry. We’re sure our creative juices will whip up some new flavors for 2018. We love our Howie fans so much we decided to give them free pizza in 2017. Yes, you read that right. All you had to do was download the Hungry Howie’s® App, sign up, and start collecting your reward points. Before you noticed, you had enough points to earn a free pizza on us. 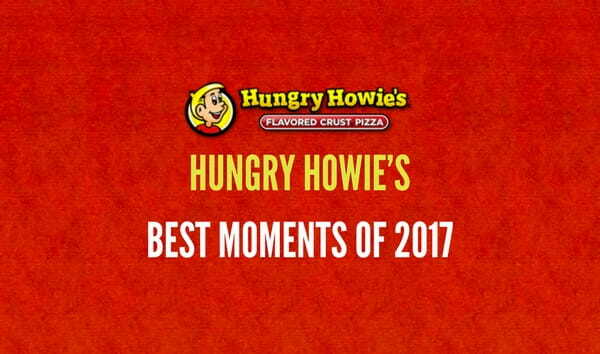 Howie Rewards™ was our way of thanking you all for your love and support. And many other Dough-Raisers you guys hosted throughout the year. 2017 marked our 9th edition of Love, Hope & Pizza®, a cause close to our heart that supports those fighting against breast cancer. The Love, Hope & Pizza® initiative makes a donation to the National Breast Cancer Foundation® for every pizza purchased throughout October. Together, Hungry Howie’s® and all of our amazing customers have raised over $2 million to help support free breast cancer screenings and breast cancer research. In 2017, we also saw a lot of you posting your pink warrior pizza costume using the hashtag #lovehopepizza to help us spread awareness and get the conversation going. Our 2017 was filled with so much love and support we cannot wait to see what 2018 has in store for us. Of course, we are sure you will be by our side to see what’s next for Howie, right?